Explanation: After four years of successful sun-gazing, the space-based SOlar and Heliospheric Observatory (SOHO) has also become the most successful comet-hunter in history, racking up 102 new comets. Above are examples of SOHO's comet discoveries imaged by LASCO, an on-board coronagraph. LASCO was designed to monitor the solar corona out to a distance of about 12 million miles while blotting out the bright solar disk. 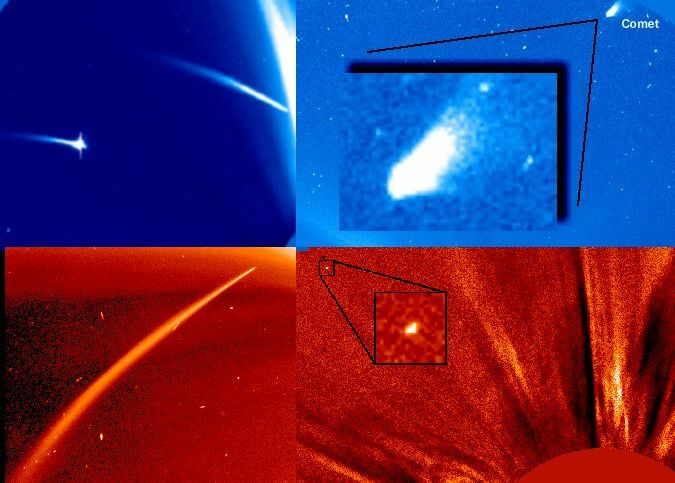 Most of the comets discovered with SOHO belong to a special class known as sungrazers - thought to be returning fragments of a large comet which broke up during its historic passage near the sun. Subject to intense solar heat and tidal forces, sungrazers (examples in the left column) are unlikely to survive their close passage. However, ten of SOHO's new comets, like those in the right column, are more "typical" comets and pass the sun at safe distances. In fact, on its outbound journey, the comet at the top right was bright enough to be seen with the unaided eye. Discovered this year on February 4th, the comet at the bottom right holds the distinction of being SOHO comet number 100.